Compact fluorescent light bulbs (CFLs) can save you as much as $40 to $135 over the life of the bulb, compared to incandescent lighting. That’s pretty amazing! While you may already be familiar with the energy savings of CFLs, few people are aware of the wide variety of CFLs that are available. From the popular spiral bulb to the decorative candle bulb, there is a compact fluorescent light bulb to fit just about any situation in your home that requires light. Following is a summary of the different types of CFL light bulbs and their uses. If you’re concerned about the aesthetics of compact fluorescent light bulbs, the A-line or A-shaped bulb may be the perfect solution for you. Essentially, it’s a spiral bulb with a dome of clear glass that mimics an incandescent light bulb. A-shaped bulbs give a good approximation of more traditional lighting — because it’s nearly impossible to tell that it’s a CFL on first glance. A globe CFL light bulb is meant to be on display — such as in a bathroom vanity fixture or a pendant light. Globe CFLs mimic globe incandescents, making them a great choice for a more retro look. Tube CFLs were some of the first compact fluorescent light bulbs available to consumers. There are quad tubes, twin tubes, and F Lamps (which are a combination of the two). If you have a fixture with space for a light bulb that is long and narrow — like wall sconces — this is the bulb you should seek. There are also specialty tube CFLs that provide a much more compact shape than the spiral CFLs do. Shaped like an incandescent candle light bulb, these CFLs are smaller, sleeker, and most appropriate for decorative lighting tasks. They come in varying sizes and colors to fit many different lamps and holiday novelty items. These CFLs — fashioned into circles of varying diameters — are most commonly used for reading lamps. They can produce either a traditional white fluorescent light or a warmer light (if an electrical ballast is included in the bulb). Post CFL bulbs are basically spiral CFLs on the inside, with a durable cover on top of that is sealed to withstand wind, rain, and snow. Post CFLs are designed for long life in outdoor conditions, so if you have outdoor light fixtures, these would be a wise choice. These CFLs are used in place of incandescent flood lights because they provide directional light. Replacing the bulbs in recessed or track lighting? Reflector CFL bulbs are what you’re looking for. There are separate reflector CFLs for indoor and outdoor use. Dimmable reflector CFL light bulbs are also available. 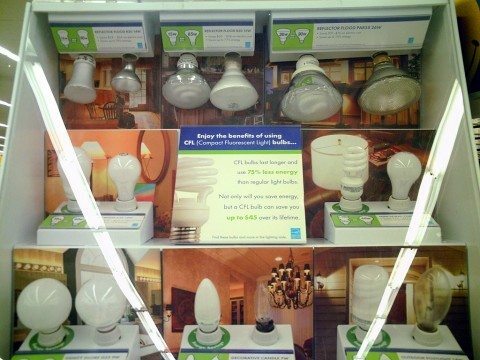 So, Which Type of CFL Lightbulb Is Right For You? With all of these options — and the significant energy savings — choosing a compact fluorescent light bulb is definitely the best choice for homeowners. You just need to decide which of the 8 types of CFLs you’d like for your particular light fixture and the lighting situation you wish to create. Only CFL bulbs marked “dimmable” will work on dimmer switches. Only CFL bulbs marked “3-way” will work on 3-way sockets. Most photocells and electric timers don’t work with CFLs. Still not sure which CFL bulb is right for your specific needs? The Energy Star Light Guide is a very cool interactive online tool that walks you through the steps to make the right choice. If you’re concerned about the initial cost difference between the 2 bulb types, try purchasing a few CFLs at a time to replace the most used incandescents in your home. LED Bulbs vs CFL Bulbs: What’s The Difference?